Next stop—more great free MED-EL rehabilitation resources! This month’s themed rehabilitation lesson kit is all about riding on the bus, so let’s get rolling. New to our themed lesson kits? If you’re an audiologist, speech & language therapist, rehabilitation specialist, or any other professional that works with children with hearing loss, these rehabilitation resources are made for you. We created this series of themed lesson kits to support rehabilitation sessions with young children. Every month, we’ll be sharing a new themed lesson kit and they’ll always be free to use and share. Each lesson kit is themed (home, animals, transport, etc.) and has multiple activities that can be used over several sessions with each child. Every kit is filled with illustrations to print out—including language-neutral illustrations. And every lesson kit has three levels, so that you can tailor it to the abilities of each child. Lesson kit #4 is themed “Buses” and focuses on the people and places you’ll see on a bus journey. In this lesson kit, there are puzzle challenges, an interactive sing-along song, and a themed board game to build listening, language, and cognition skills. This comprehensive lesson kit is designed to be printed and reused. This kit has lesson plans with detailed therapist notes and a range of activities for each of the three levels. There’s print resources and step-by-step guidance for each activity. We’ve also included useful strategies in each lesson to help achieve the listening and language goals. All of the lesson kits will be available free of charge—we’re here to support your work and the success of every recipient. They can be printed, emailed, shared with colleagues, and even given to parents as supplemental at-home rehabilitation resources between sessions. Ready to get started? 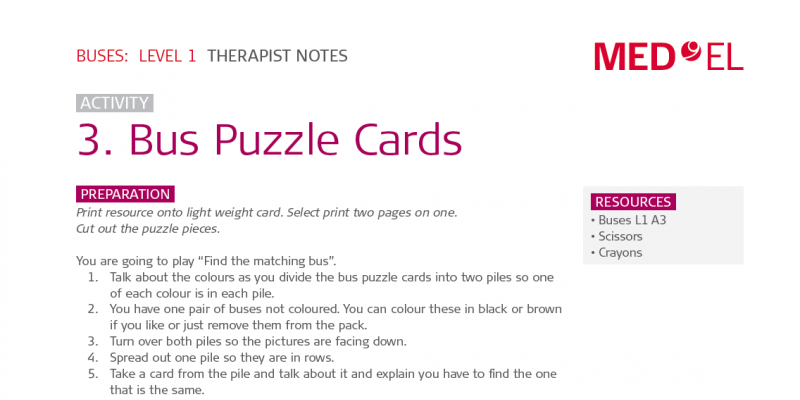 Download the “Buses” lesson kit pdf now!